Domain time is one of the most exciting experiences when it comes to starting a new idea online but unfortunately not always. You’re checking your ideas one by one and it seems all of them are already registered before and you know, you run out of new ideas. Here is where domain finder or domain name generators come in handy. In today’s post, I’ve compiled a list of the best domain finder tools that I use when I’m looking for a new domain or business name. I have bookmarked some of these 7 essential websites. I think you should too. There are more websites with such generators out there, but on this list, I’ve only listed the best ones in term of design, usability, and features. 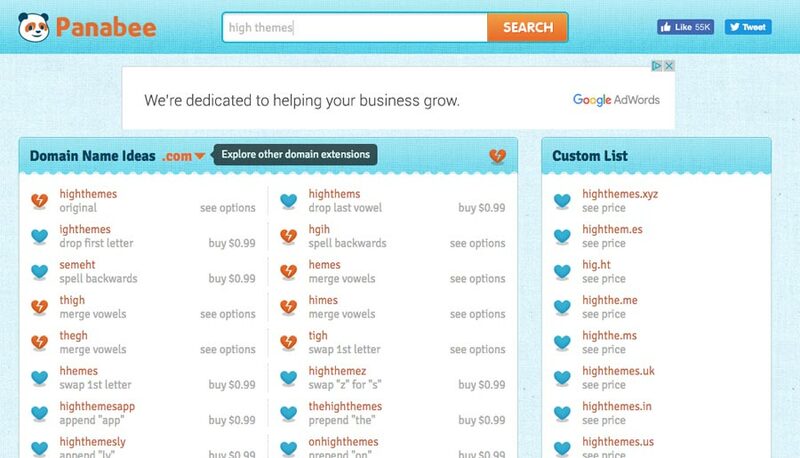 This outstanding tool helps you find your dream domain by offering a smart and fast domain finder which does a great job playing with your search input. 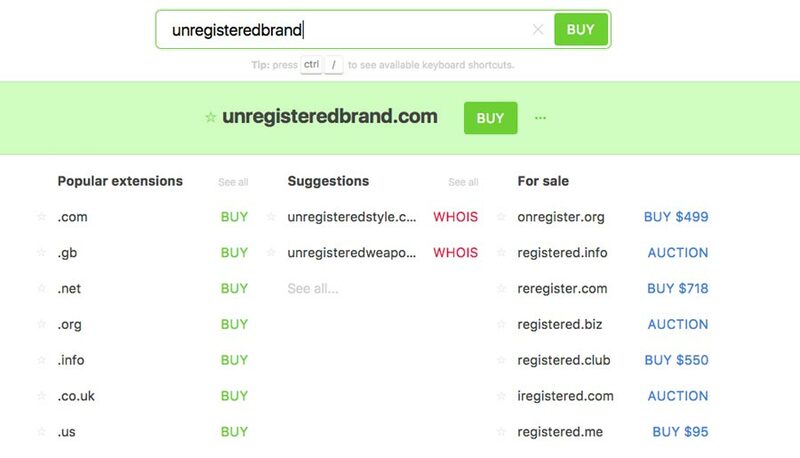 Once you enter a keyword and press the search domain button, in less than 1 second, more than 1000 available domains will be at your disposal. You can narrow down the results to those that only start with the search term, or those that end with it. Also, you can sort them by length, popularity, and alphabetical. Namemesh is another leading domain finder to haunt perfect domains. There is no need to explain how it works because the user interface is pretty self-explanatory. SIMILAR: checks some alternative words from a dictionary or finds related names from a large database of 6 million words. 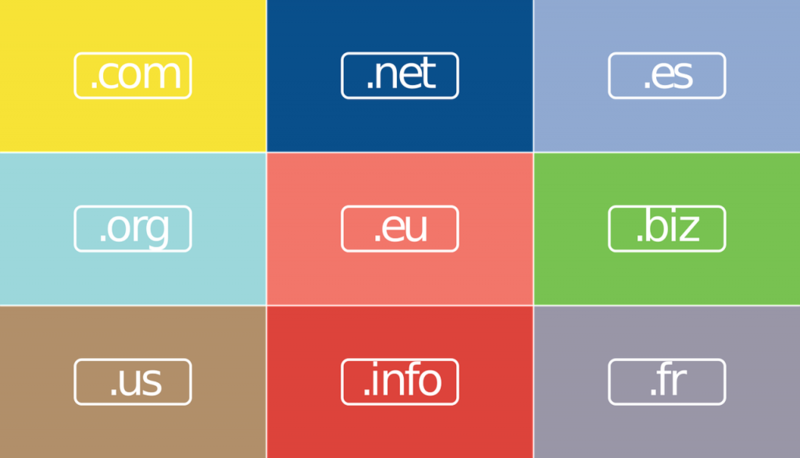 NEW: interested in new gTLDs generally available to register? This box is yours. SEO: suggests domain names by preserving the main keyword and adding relevant prefixes/suffixes; best suited for SEO purposes. SHORT: This one is certainly a creative feature of Namemesh. It plays with your search term and tries to create short domain names by overlapping the keywords with the TLDs, like citi.es. FUN: Using some inner builtin techniques, modifies the existing keywords to generate fun brandable words. EXTRA: checks the domain names with other TLDs like .co/.io/.it etc. MIX: plays with suffixes like “ly”, “ify” etc to generate new domains. Try it now and you will definitely love it. 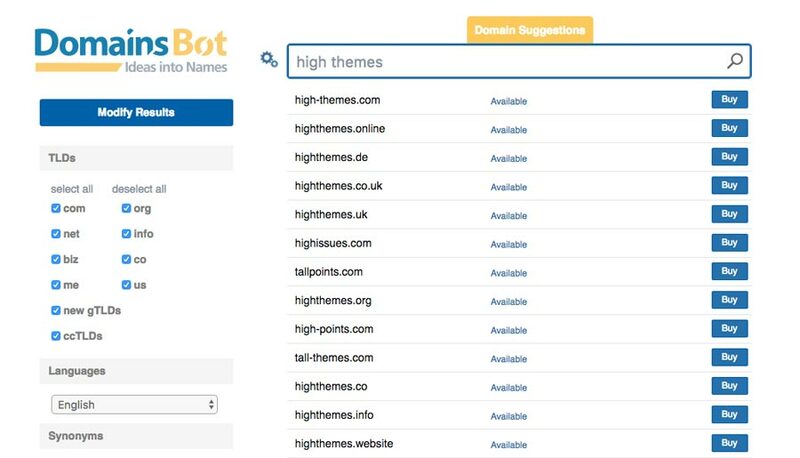 DomainsBot is a top-rated tool for domain suggestion. It has a simple convenient user interface with powerful options to modify your search results and make it more specific. 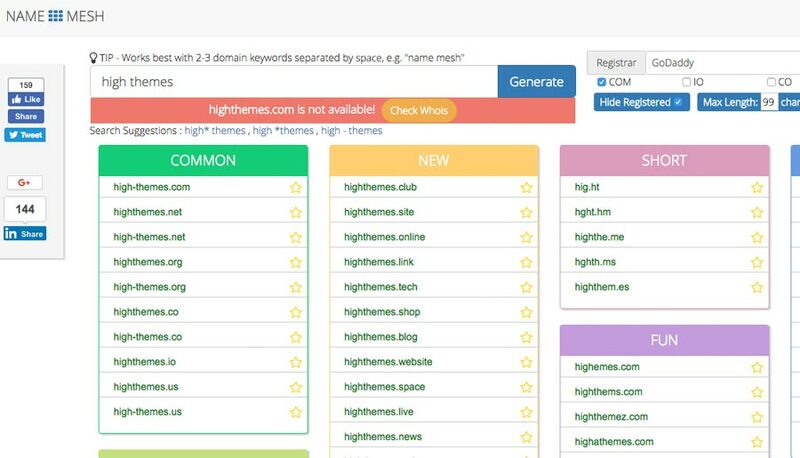 You can limit the TLDs to those you’re looking for, add synonyms, user prefixes/suffixes and sort the result based on recommendations or availability. Panabee is a simple way to search for new domain names and ideas for naming your next application, website or company. It comes with a nicely designed interface which is elegant yet usable. You can start searching by describing your idea in two words inside the search box. PanaBee presents plenty of suggestions based on your main idea by mixing many factors including domain trends, abbreviations, syllables, prefixes and much more. The outcome is pretty helpful and inspirational. It also takes an extra step for you, listing the related terms to your idea, which can help you consider alternatives too. Panabee is not only for main TLDS; use PanaBee for the international domains like .co.uk, .in and com.au as well. Finally, PanaBee offers a unique complementary tool as well. Besides domain names, Panabee checks availability on the most popular social media sites: Facebook, Tumblr, Twitter, and Instagram. 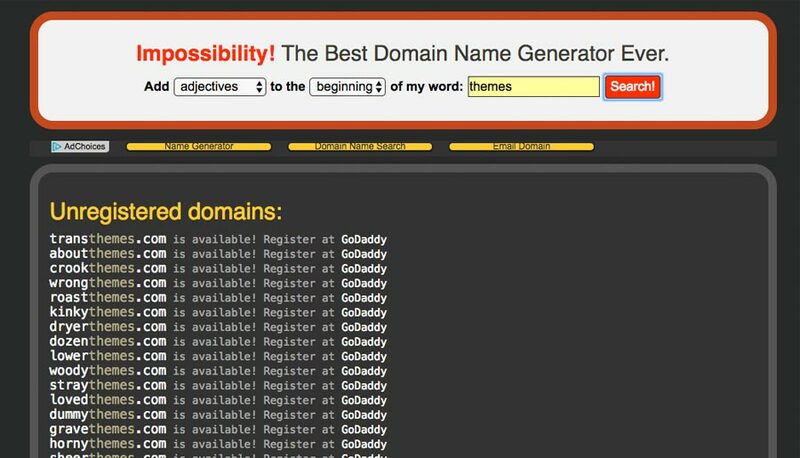 Impossibility has its own approach to help you find your desired website name. It uses your keyword but asks you to choose an addition of adjectives, verbs or nouns to the beginning or end of your keyword. I like the simplicity of the idea and use it when I know the name structure. I featured Instant Domain Search because of its as-you-type functionality. You don’t even need to wait 1 second to get some ideas about the availability of a domain or some cool alternatives. As you type your idea inside the search box, the results get updated. 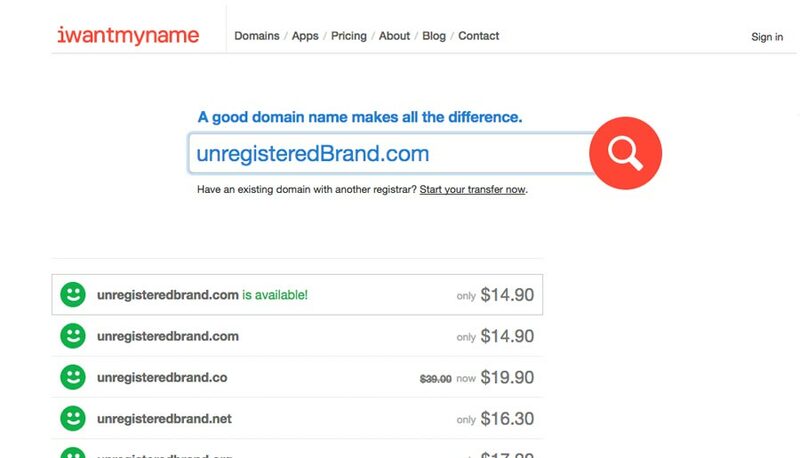 If you have a list of domain name ideas to check, this one stands out from the rest. Its ease of use, clutter-free design, and AJAX search, make it a winner over other competitors. Of course, the suggestions are not as smart as other tools, but for instant searching, it has the smartest way. If you have a name in mind, I Want My Name comes in handy. Enter your domain name and instantly it checks whether it’s available to grab or not. If not, it’ll show a list of available TLDs with their registration fee, making it easier to decide about registration of your domain.